When you own a ship, live on it with your family and work on it, every day, it makes sense to invest the time and develop something which matches your needs. The Leenmans family has all the experience to do so, with both father and son active in the same company, Leenmans Waterwerken. Owning and operating two crane barges for decades, the company was up for a newbuild in 2016. With their well thought out concept design, they went to Asto shipyard in Raamsdonksveer, whom they contracted to further design and build the ship. The ship was christened as Innovatie (Dutch for Innovation) on 1st September 2018. True to her name, the design incorporates a number of innovations, which make the vessel more efficient and more comfortable, all the while maintaining the work-horse capabilities expected from such a vessel. The Innovatie will be mainly used for dredging works in inland waterways and harbours, but she can be used for transport of granulate in bulk and even has push bows to push a second barge. The main tool onboard is the M-Tec 300E deck crane, which can move forward and aft over the tracks on either side of the hopper. Asto contracted Shipbuilding Solutions (Krimpen aan de IJssel) to translate the concept design into a fully working, buildable and classable ship design. The most characteristic feature of the design is that a full diesel-electric power system was chosen, with a forward engine room providing the power for both the propulsion motors and the full-electric crane. As the vessel is owner operated, without a separate crew onboard (often housed on the foredeck), the engine room was placed forward. This means that the noise and exhaust-generating gensets are quite far away from the accommodation. The forward position of the engine room had a further advantage. As the aft engine room is more compact than usual, because it needs to house only the two Veth L-drives and the Variable Frequency Drives need to control them, it was possible to create a two-layer accommodation, with sleeping quarters below deck and the living area and galley above the main deck. The wheelhouse is located in front of the accommodation and can be lowered by one meter to achieve an air draught of only 6,6 metres to pass under bridges. Choosing for diesel-electric propulsion installation has two main advantages. First of all, less power-generating units need to be installed onboard, as the same power source can deliver the power for the crane, pumps, L-drive thrusters and bowthruster. These are never used at full power at the same moment, so it makes sense to share the power production. The second advantage is that the power production can be better matched to the consumption, leading to a better-loaded engine than when each propeller and the crane would have their own power source. The owner did not stop there. Although it is not yet required, he specified SCR catalytic converters to clean the exhaust gases. The system injects a small quantity of Urea into the exhaust, which will react with the NOx gases and result in harmless nitrogen, water and carbon dioxide. A good SCR system can reduce the emission of NOx gases by 90 per cent. As the dredging jobs are often done close to residential areas, with strict air pollution norms, it is a real benefit in public tenders if the vessel has a cleaner exhaust – comparable with road trucks. In addition, it also makes sense for the ship owner who lives onboard with his wife and children to have the air as clean as possible. The SCR exhaust after treatment system, which includes a soot filter, was supplied by Solfic. Innovatie’s propulsion is with two electrically driven L-drives aft and a Steering Grid bow thruster, both from Veth Propulsion. This combination leads to excellent maneuverability, and due to the electric drives, very precise positioning is possible. The propellers have nozzles to ensure sufficient thrust at low speed. The variable frequency drives (VFD’s) are located in the aft engine room and are water-cooled by means of a boxcooler in the side. The temperature differential is however not sufficient to recuperate heat for the heating of the accommodation, which has electrical floor heating from Speedheat. All propulsion motors onboard are air-cooled. At the moment, there is no battery bank onboard for the storage of energy, but the DE system architecture is such that in the future, it is a lot easier to change over from diesel fuel to another source of energy. The fuel tanks are located both in the bow and in the stern, and there is a dedicated tank section for ‘white diesel’, which is required as fuel in some areas in Germany. There is of course also sufficient tank capacity for the Urea of the SCR system. The hopper is entirely box-shaped. To endure the frequent poundings of the grab bucket, the floor surface of the hopper is built from Hardox Wear Plate, a hardened type of steel with much higher abrasion resistance than normal steel. The welding of Hardox requires special precautions, such as pre-heating and controlled (slower) cooling. On the forward and aft side of the hopper are overflows, a vertical channel, similar to a moonpool. There are also ballast tanks adjacent to aft bulkhead of the hopper, with the idea that these can be opened to the hopper and equipped with bottom doors at a later stage. For now, Innovatie discharges only with the grab bucket. When doing transits without cargo or dredged material onboard, it is often useful to have a low airdraught. On Innovatie, a jet pump is installed to quickly fill and empty the hopper with water as ballast. The jet pump is essentially a propeller in a pipe, which can transfer a high quantity of water in a short time over a short height. 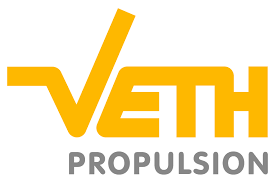 The jet pump on Innovatie is in fact an elbow thruster from Veth Propulsion, with a capacity of 12,000 m3 per hour. Depending of the location and the material to be dredged, the hopper will be filled in five to six hours. When fully loaded, the Innovatie sails to a discharge location. In Rotterdam, this is a dedicated ‘hole’ on the harbor seafloor, where the dredged material is collected and picked up by a large suction hopper dredger once in a while, which brings it out to sea. When lowering the grab bucket, the crane’s winch motors start to generate energy rather than consume it. This energy is dissipated in a load bank, consisting of electric heaters. To facilitate position keeping during dredging or discharging, or when spending the night on a river or canal, Innovatie is equipped with two spud poles. One is in the bow, and one is located in the portside aft corner of the hopper, in a walled-off section for this purpose. Both spud poles consist of five telescopic elements, allowing them to be used at a water depth of up to 25 metres under the keel. Each spud pole has two winches to lift the sections, and the whole system was custom-designed and supplied by Boterman Techniek (Zwolle). The spud pole winches are controllable from the control cabin of the crane, allowing for quick short repositioning of the vessel using the crane. Innovatie was the first dredger for Asto shipyard shipbuilding, but project manager Stijn Buijks indicated that there were no particular difficulties in comparison with the inland tankers and dry-bulk barges they are reputed for. Currently Asto is building a 110 and a 135 metres tanker and two 85-metre dry cargo barges.